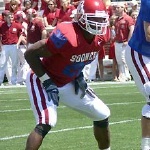 NORMAN, Okla. -- Being a bit one-dimensional got Adrian Peterson pretty far. Adding other threats to his game could make him an even bigger star. 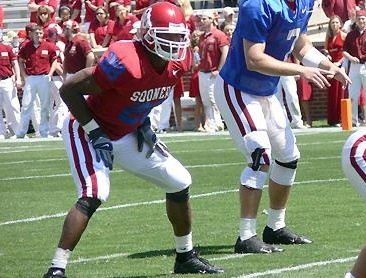 Peterson ran for an NCAA freshman record 1,925 yards and emerged on the national scene with a second-place finish in the Heisman Trophy voting in Oklahoma's run to the BCS title game in 2004. He struggled with an ankle injury last season and was limited to 1,108 rushing yards. But while rushing for more than 3,000 yards in his first two seasons, Peterson has only 14 receptions for 62 yards in his college career. "I can catch the ball," Peterson said after Saturday's Red-White spring game. "You've got to throw it to me." Peterson had three catches for 31 yards in the scrimmage. That might not sound like much, but consider this: His biggest receiving game to this point was four catches for 18 yards last year at UCLA. It's the only time he's ever caught more than two passes in his 22 college games. Kevin Wilson, who took over as offensive coordinator when Chuck Long became San Diego State's head coach in December, said the Sooners are looking for smart ways to be more aggressive. One way would be getting Peterson the ball on short, low-risk passes. "We never got to it maybe as much as we should a year ago," Wilson said. "He's running through loaded boxes. When you get him out to the perimeter, there's not five, six or seven arm tackles. There's one arm tackle. During the scrimmage, Peterson caught two early screen passes and then picked up 9 yards on a swing pass to the right side. "We're going to get him the ball more in the passing game this year. We have him coming out of the backfield a lot where he's maybe the second or third read, depending on what they do," said quarterback Rhett Bomar, who completed 11 of 22 passes for 173 yards, one touchdown and one interception. "We'll dump it down to him if something's there and let him make a play in the open field." Peterson fell behind in the passing game because injuries limited him in the fall before his freshman season and kept him out of spring camp last year. He was frequently replaced by other tailbacks on passing downs. "He hasn't been through any springs and this one I think he wanted to improve on being a pass-catcher out of the backfield and blocking," Bomar said. Instead of wearing a blue jersey like Bomar and backup quarterback Joey Halzle, Peterson wore a red jersey with blue numbers. Defenders still weren't allowed to tackle him. He carried the ball only five times for 2 yards, and was ruled down at the first sign of contact. "One of those first two screens, he might of taken it a long way if he doesn't have those blue numbers," Bomar said. "A touch or a little hand tackle isn't going to tackle Adrian." To a certain extent, Wilson said the Sooners -- coming off an 8-4 season that concluded with an upset of Oregon in the Holiday Bowl -- are still experimenting to see how Peterson can handle an increased role in the passing game. "I think he catches the ball adequately good. He's not great at it," Wilson said. "We've challenged him to be a more complete player. He knows at the next level someday that's important to protect the quarterback and to be a guy that can catch the ball. I think he's working at it. He has a chance to be a good route-runner. We'll see." Regardless, the Sooners expect to have Peterson running at full strength again -- and he's already shown what he can do just taking handoffs. "Everybody knows he's a great player," Bomar said. "He's 100 percent healthy right now and he's going to be dangerous." Using a contrived scoring system awarding points for turnovers, first downs and other plays, the defense outscored the offense 41-30. ... Mike Knall, who became the Sooners' top punter when starter Cody Freeby was dismissed this week, averaged 37.4 yards on eight punts. ... Paul Thompson, a converted quarterback, led all receivers with four catches for 82 yards. ... Halzle threw three interceptions, two to Nic Harris, and has seven total in the last two scrimmages. ... On consecutive plays in the fourth quarter, CB Reggie Smith fumbled a punt, had an interception overturned by a pass interference call, then picked off another Bomar pass.